The video shows the leaders participating in the BRICS and SCO summits, riding small electric cars, playing football and taking selfies together. 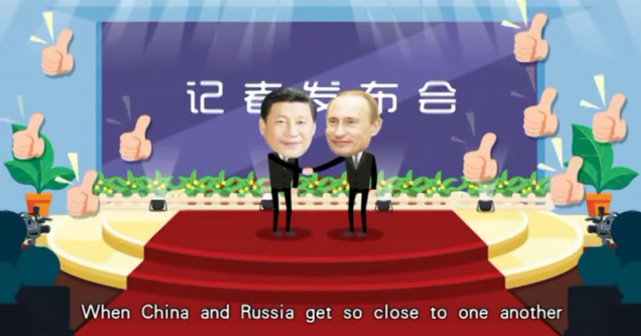 China’s Fu Xing Lu Shang studio produced a cartoon video that explains why President Xi Jinping is taking part in the Shanghai Cooperation Organization (SCO) and BRICS summits. The video shows Xi and Russian President Vladimir Putin participating in the twin summits, riding small electric cars, playing football and taking selfies together. It also talks briefly about the Cold War and explains why the summits are not a threat to the West. The cartoon also explains why Xi and Putin meet so often, despite the fact that the regular meetings irk the rivals of both countries. The video, released on July 6, was viewed by more than a million people on the first night on the Chinese segment of the Internet, according to China International Broadcasting Network. According to Chinese website News Sina, the Chinese government regularly commissions the Fu Xing Lu Shang studio to make educational videos. In 2013, the studio produced small cartoon videos about Barack Obama, David Cameron and Xi Jinping. It has also made videos on the Chinese Communist Party.